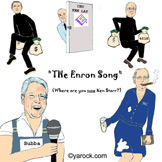 "The Enron Song" (Where are you now Ken Starr? )Listen to a wacky musical treatment of the whole "crooked crew." Guest vocals by "Bubba Clinton." Watch the Enron Song Video here! 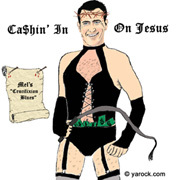 "Cashin In On Jesus" Listen to and buy Mel's Crucifixion Blues. "Jihad Rock," Jihad Johnny," and "Terrorist Nightmares"Listen to and Buy the Songs The Terrorists Don't Want You To Hear by Yarock Productions! 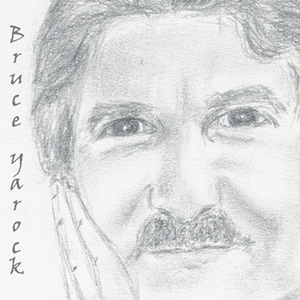 "Miles Away" - Listen to Bruce Yarock's double CD with 22 songs! "Greetings From The Holy Land"- A 4 song trip to the land of the Suicide bomber, featuring "Pali Girl." She's a suicidial "Valley Girl," - Like Oh Allah! The Meria Heller Show, The Mike Malloy Show and the Richard Simmons Show!